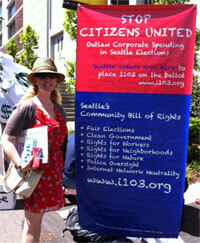 A Seattle area activist has had it with corporations meddling with elections, and intends to do something about it. Jeff Reifman has decided that as a city, Seattle should declare that corporations are in fact not people, and is gathering signatures to put Initiative 103 up for a city-wide vote. The city-wide initiative would eliminate corporate personhood, ban corporate spending on elections, and establish a community bill of rights. In order to do so, Reifman will need to collect 20,629 signatures from Seattle residents, or 10% of the votes cast during the last mayoral election. Along with restricting corporate personhood and preventing corporations from purchasing local elections, Initiative 103’s Community Bill of Rights would extend some pretty innovative rights to Seattle residents. As an example of the need for reform, Reifman points to Seattle’s current legal battle with private phone books companies. Reifman has clearly done his research. The initiative replicates successful community rights initiatives that have been passed in Pittsburgh, Pennsylvania and Buffalo, New York. Currently in Washington both Bellingham and Spokane are attempting to push similar community rights initiatives. The rights enumerated under the initiative are quite extensive, and made me wonder if the initiative would pass Washington state’s Single Subject clause. In 2000, Tim Eyman’s I-695 was struck down in court for covering two topics: setting the price of car tabs and requiring a 2/3rds majority for tax increases. So I checked with Seattle’s law department. “We don’t disqualify initiatives on a single subject rule at this stage,” said Monica Simmons in the city clerk’s office. If and only if the law passes, then it could be challenged. Regardless of future rulings, Reifman hopes to change the discussion on corporate personhood.